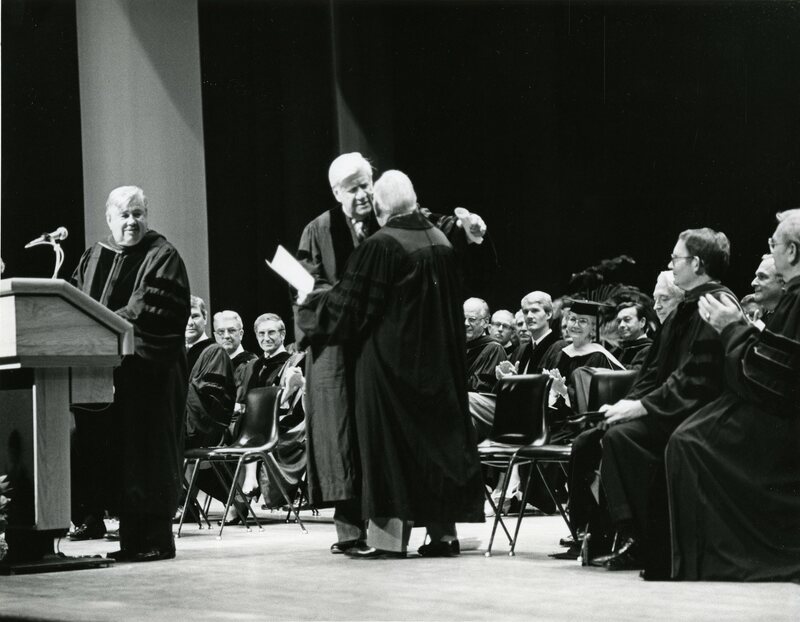 Thirty years ago, on May 15, 1985, hundreds gathered in Ruby Diamond Auditorium at Florida State University for the dedication of the Mildred and Claude Pepper Library and to watch Representative Claude Pepper receive one of his highest honors from FSU. During his career, Claude Pepper forged connections with several Florida colleges and universities. 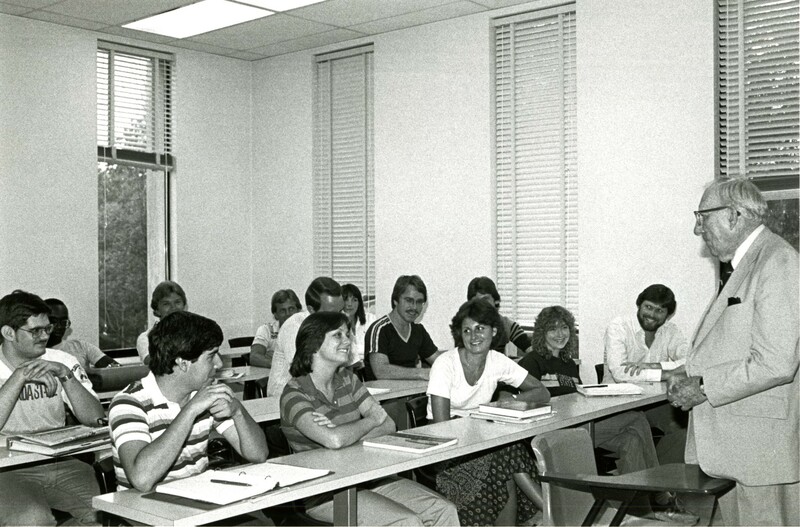 However it was a personal connection to Florida State College for Women (FSCW), and later FSU, which led him to entrust the papers and artifacts from his years of public service to the university. In recognition of his work and long relationship with the school, Florida State President Bernard Sliger conferred an Honorary Doctorate of Humane Letters on Claude Pepper at the ceremony. Claude and his wife, Mildred, were a regular presence on the Florida State campus although he had never been in the classroom as a student. Over the decades, they frequently visited the university and attended sporting events and homecomings. Mildred Pepper endowed a scholarship for students in the fashion school. 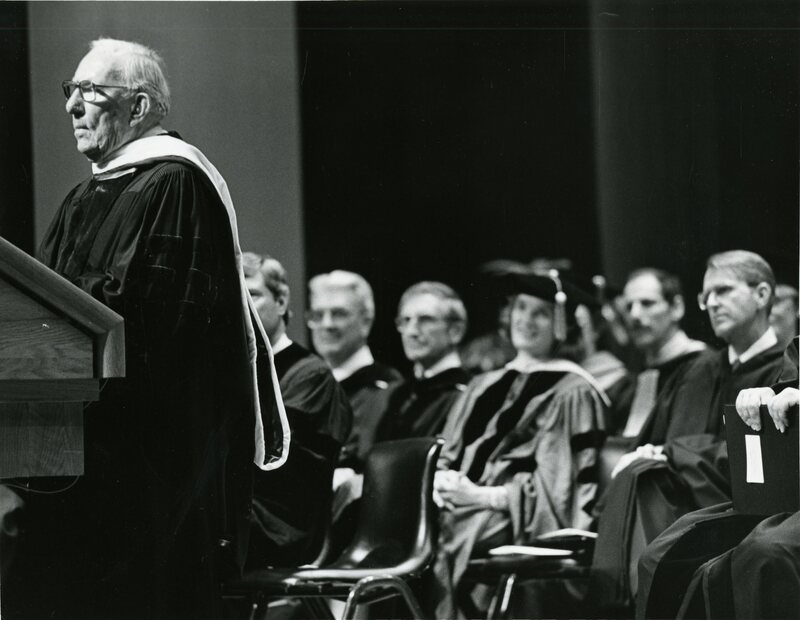 Claude Pepper spoke on campus many times – including giving a commencement address in 1977. Claude Pepper received the Gold Key in 1938 when he spoke at the FSCW and was later made an honorary alumnus of Florida State University. His 84th birthday party was a gala fundraiser emceed by Bob Hope that raised funds for the creation of the Mildred and Claude Pepper Eminent Scholars Chair of Social Gerontology as part of the Pepper’s legacy at Florida State. Claude Pepper became connected to Florida State University through his time in Tallahassee and relationship with Mildred, a former student of Florida State College for Women. In the months before her death, Mildred Pepper returned to FSU with Claude to determine the location for the Pepper Library and museum. They decided on Dodd Hall- it had been the library Mildred had studied in as an undergraduate. 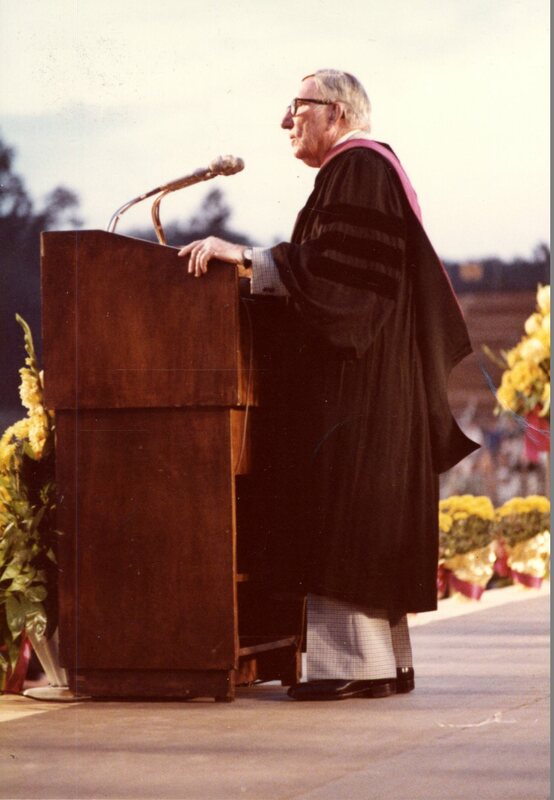 In his remarks upon receiving his honorary degree, Pepper acknowledged the credit owed to Mildred as his “absent partner.” He believed Florida State University was a fitting place for his papers and museum because her spirit and memories would always be part of the campus. The permanent home for his work would be a monument to all that he and Mildred had achieved together. 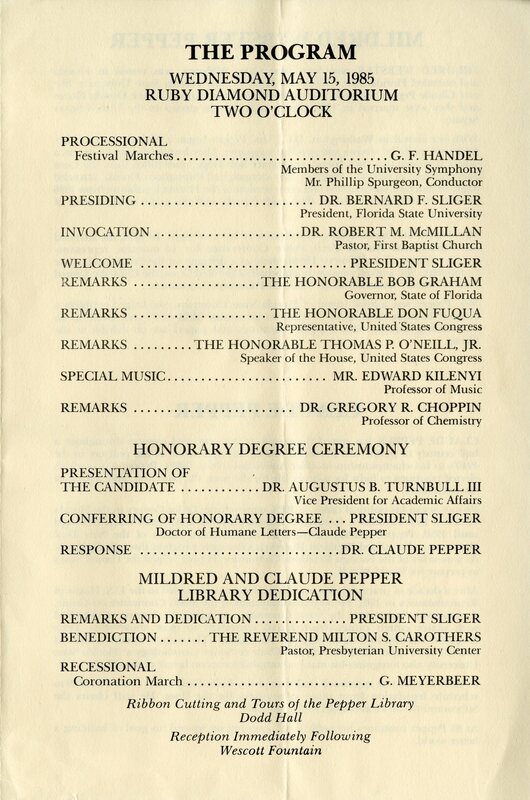 Florida State University President Bernard Sliger invited preeminent politicians to speak about Claude Pepper’s accomplishments before awarding the honorary doctorate. Speaker of the House Tip O’Neill, Florida Governor Bob Graham, and Representative Don Fuqua were invited not just because of the seats they held, but because they were friends and close allies to Claude. Governor Graham spoke for the people of Florida about Pepper’s decades of work both for the state and representing Floridians’ interests on the national stage. Fuqua, the representative for Florida’s 2nd district including Tallahassee, welcomed and introduced the members of Congress that had flown down from the Capitol D.C. for the celebration of Claude Pepper. Tip O’Neill spoke, at the invitation of President Sliger, about Pepper’s tenacious work on behalf of all Americans to protect policies including the New Deal, civil rights, Social Security, and Medicare. They had worked closely on an agenda since O’Neill’s selection as Speak of the House in 1977. In that time, the Speaker had placed Pepper on the bipartisan commission on Social Security and gave him the chairmanship of the powerful House Rules Committee. Correspondence and other documents from Claude and Mildred Pepper’s work with Florida State University as well as videos of the ceremony can be found in the Claude Pepper Papers held at the Pepper Library. For more than two hundred additional images from the Pepper’s visits to FSU and the dedication of the Pepper Library, please visit the Florida State University Digital Library. 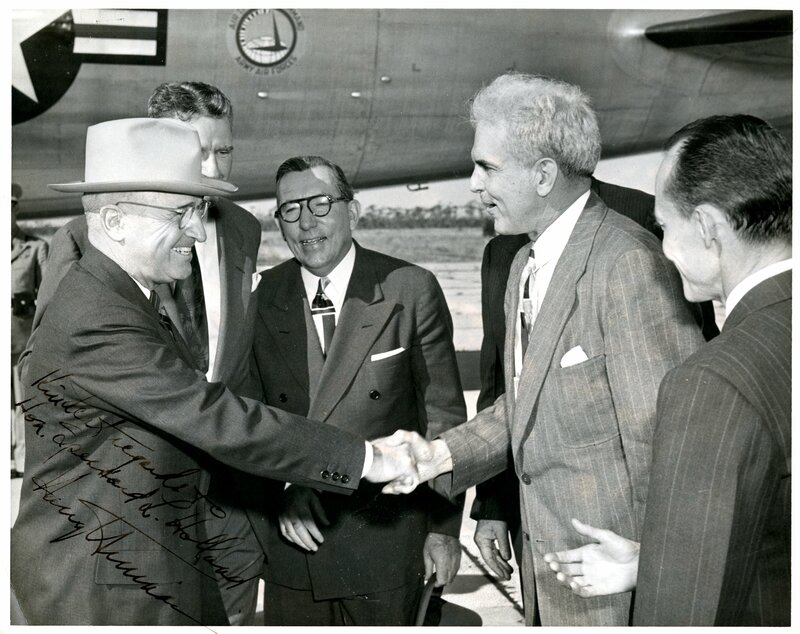 The Florida State University Digital Library currently contains over 7,500 photographs from Claude Pepper’s life and career in public service. At the Claude Pepper Library we are regularly making more images available and each new batch provides a glimpse into history through Pepper’s eyes. Claude Pepper witnessed the build-up to, and aftermath of, World War II while travelling through Europe in 1938 and 1945. The stark differences he encountered are demonstrated in the photographs from his parallel visits to Nuremberg, Germany. 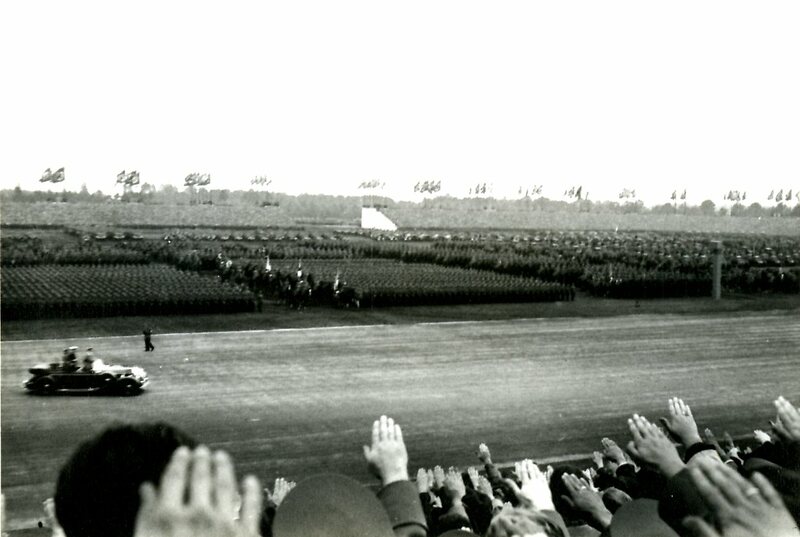 In 1938, Pepper made a short detour in his trip to see the 10th Party Congress of the Nazis, the last of what is now called the Nuremberg Rallies. 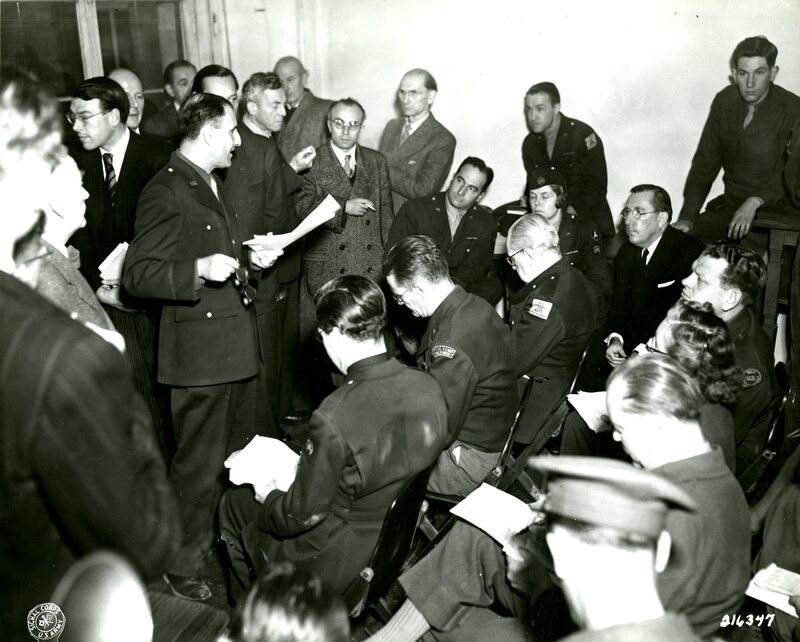 He returned to Nuremberg in the fall of 1945 to watch the preparations for international tribunal, meet with the American and British prosecutors, and attend the opening days of the trial. Claude Pepper, along with his wife Mildred, took a long trip through Europe during August and September of 1938. They were not merely tourists, but met with political leaders and participated in Inter-parliamentary Union events while touring England, Holland, Germany, Switzerland, and Italy. The Peppers paid close attention to the military buildup and preparations for war they saw as they traveled through each nation. Simultaneously, the Senator watched with optimism as the major powers attempted to negotiate for peace and placed his hope in the most recent agreement between England and Germany. Once in Germany, Pepper determined to attend the Party Congress in Nuremberg on September 7 and 8. 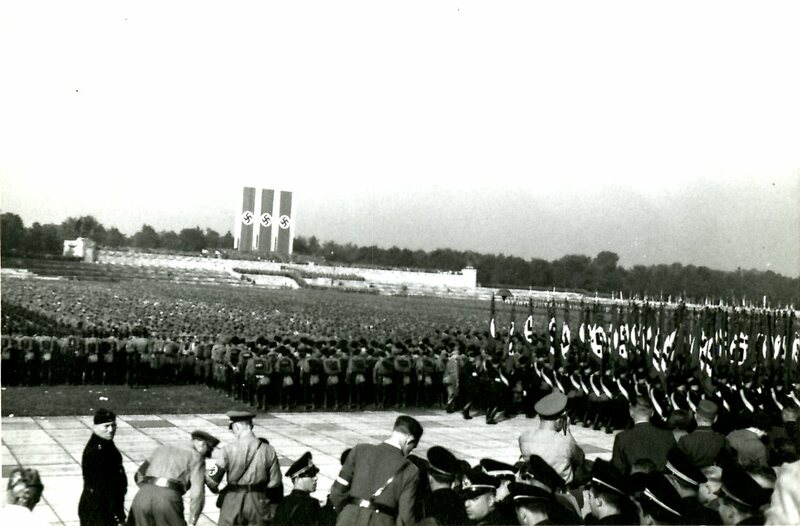 He watched the precision marching of troops as well as thousands of “labor boys and girls” in front of the podium where Hitler and Deputy Chancellor Hess gave their speeches. From his place in the stands, facing the crowd, Pepper was able to feel the effect of this “display of mass movement and mass emotion”. 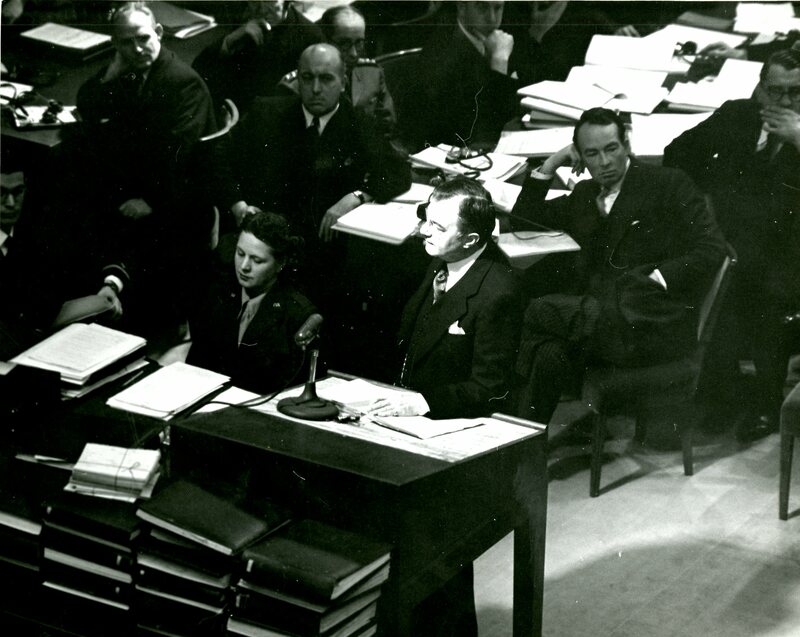 (Claude Pepper Diary, 09-07-1938) Pepper would encounter these party leaders again in Nuremberg seven years later when he attended their trials on war crimes charges. Within months of the end of World War II, Claude Pepper planned a wide-ranging tour of Europe and the Middle East. He arrived in England in August 1945 and traveled through nations including Germany, Russia, Iran, Iraq, Palestine, Syria, Saudi Arabia, Greece, Italy, Austria, Yugoslavia, and Czechoslovakia before returning home in mid-December. Pepper dedicated two weeks, from November 9 to 23, to his stay in Nuremberg. More images of Nuremberg and other destinations from Claude Pepper’s trips through Europe are available at the Florida State University Digital Library. Documents from these tours as well as diary transcripts can be found at the Claude Pepper Library. The Claude Pepper Library is home to a collection of over 2,000 photographs from Spessard Holland’s long career representing Florida in the United States Senate and as its 28th governor. 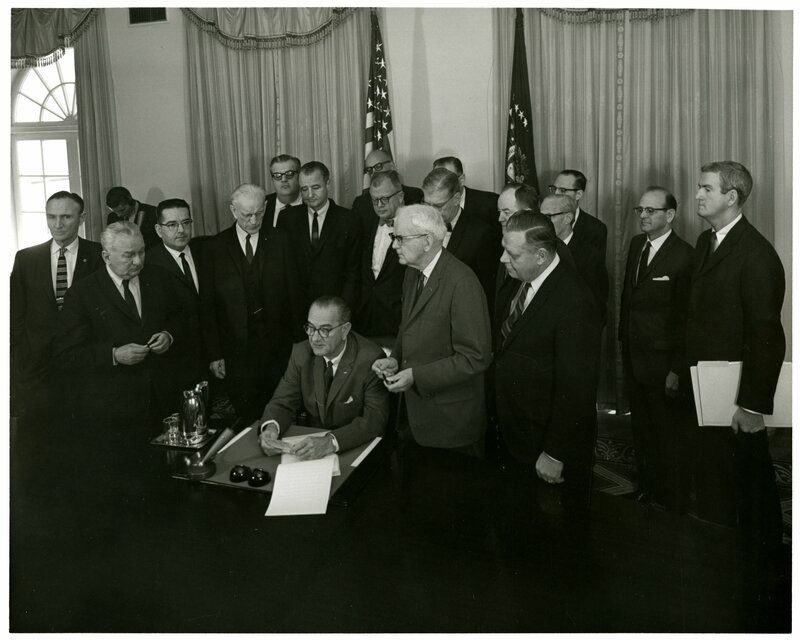 These images provide a glimpse into his work on behalf of the state of Florida and with many of the preeminent political figures of the 20th century. Holland was a lifelong resident of Bartow, Florida. He was born in the central Florida town to Benjamin F. and Virginia Holland in 1892. 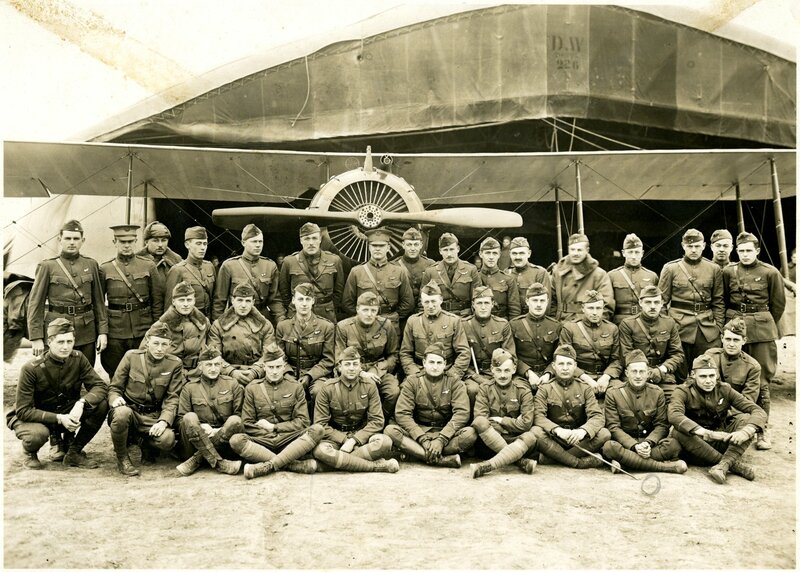 Despite leaving several times – to Atlanta to earn a bachelor’s degree at Emory University, then to Gainesville to study Law at the University of Florida, and to France during his service in the Army Air Corps during World War I – he always returned to his hometown. He was interred in Bartow in 1971 upon his death. The earliest photographs in the series include portraits of Holland as a child and with his fellow service men while stationed in Paris. However the majority of the images, taken during his thirty years in office, are devoted to Holland’s political work. 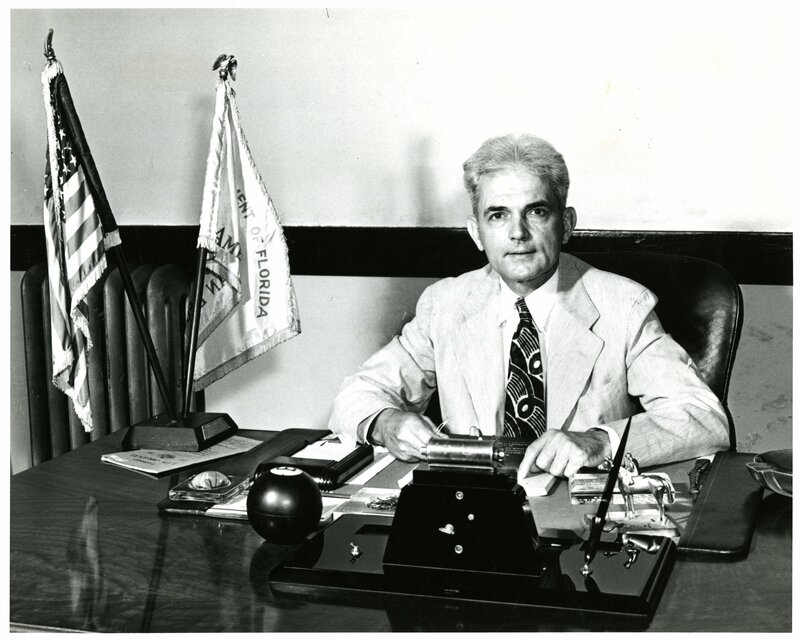 During the United States involvement in World War II, Holland served as the 28th Governor of Florida. He oversaw Florida’s participation in the wartime defense effort and the development of infrastructure to support this growth. The series of photographs illustrates Holland’s term in office from Election Day in 1940 through his departure in 1945. 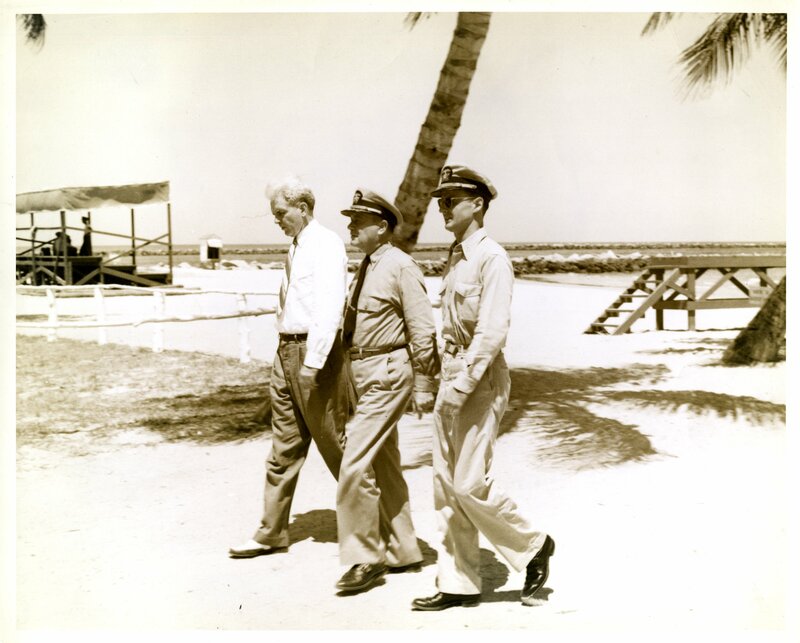 These images document Florida’s vital work during World War II at military bases, air fields, and shipyards; as well as Holland’s work on issues of tax reform and sponsoring Florida agriculture, which would remain central policy positions throughout his career. The collection also contains several family photos taken during Holland’s term as governor. These depict Mary Groover Holland in her duties as first lady as well as informal photos of family life in the Governor’s mansion in Tallahassee and throughout Florida. Governor Millard Caldwell appointed Spessard Holland to the United States Senate on September 25, 1946 following the death of Charles O. Andrews. Holland was formally elected to the seat in November of that year and served four consecutive terms until his retirement in 1971. The political changes that occurred over this quarter century can be witnessed in the collection. Holland’s relationship with the each Presidential administration, working most closely with fellow Democrats Truman and Johnson, is tacit in the images. Frequent travel, a significant part of the Senator’s life, is documented in this collection. Holland would attend events throughout Florida before returning to his senatorial office in Washington D.C., as well as congressional trips to Central America and up to the Pacific Northwest and Alaska. Holland was committed to the success of the Florida space program. The collection contains images from his frequent trips to the Florida Space Coast taken during his ten years of service on the National Aeronautical and Space Committee. These show visits to launch and training sites as well as the crowds watching the subsequent lift-off. 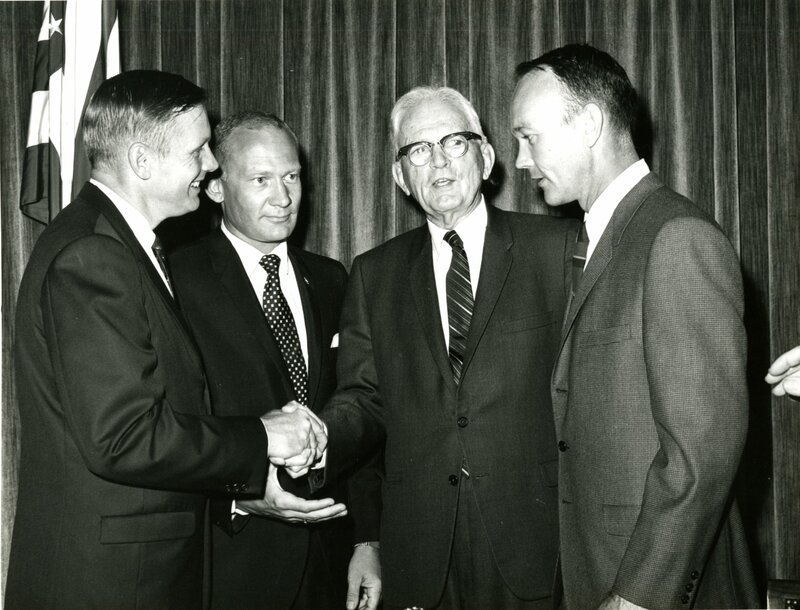 Holland met with the crew of Apollo 11 and the Mercury 7 astronauts, receiving inscribed photographs from Gus Grissom, John Glenn, and Alan Shepard. Over three decades, the photographs document Spessard Holland’s close relationships with many prominent political figures in Florida, Washington, D.C., and Latin American. Perhaps the most visible of his colleagues were his corresponding Florida Senator Claude Pepper and later George Smathers. The public life of a United States congressman – attending committee meetings, visiting with constituents, luncheons with interest group, and campaign banquets – were often done in conjunction with these men and his fellow Florida representatives. The images are only part of the Spessard Holland collection. 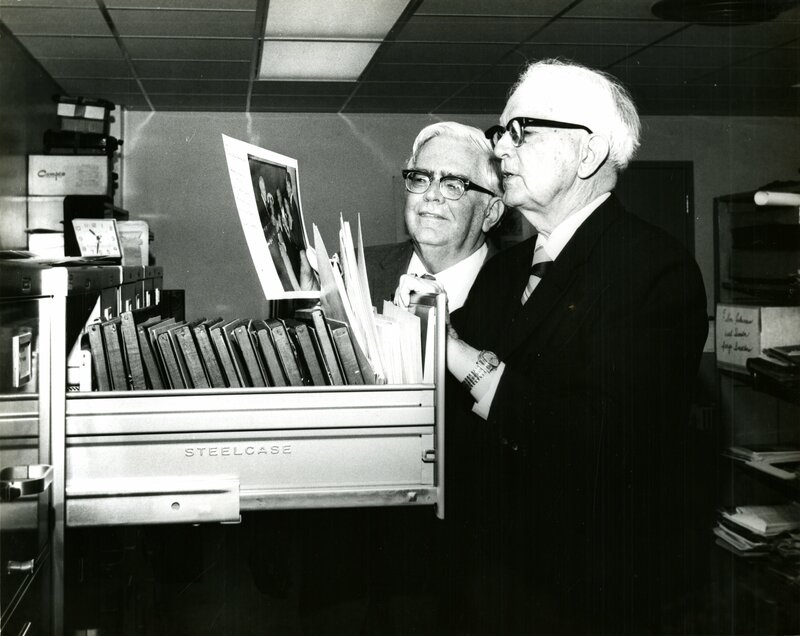 The photographs are held at the Claude Pepper Library along with biographies on Holland’s life, personal correspondence, campaign files, Floridiana, and memorabilia. 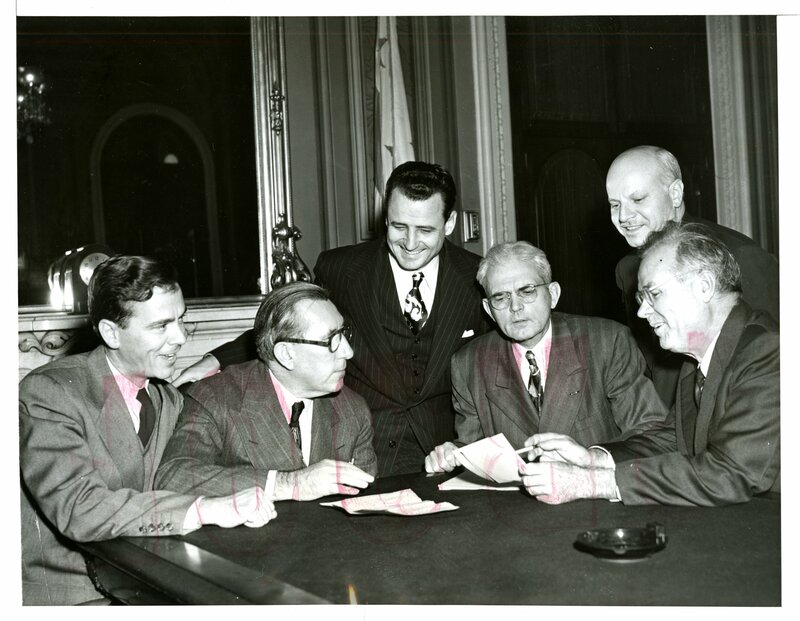 More images of Spessard Holland during his terms of office can be seen in the Claude Pepper Digital Photograph Collection.